There are many benefits to replacing faulty power points and light switches. Two main points are safety and aesthetics. As switches and power points age the plastic that they are made with becomes very brittle. The brittle plastic is prone to cracking with normal use. As the plastic cracks the electrical components behind the switch or power point can become exposed leading to direct contact with live electrical parts. Occasionally the surrond plate will crack and then possibly begin to fall away from the wall. Other times the crack can form on the plastic clips on the edges of the switch mechanism. When these clips break the plastic cover can very easily fall out and live contacts will become exposed. 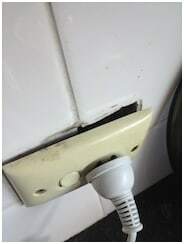 Whether the plate has fallen away from the wall or the rocker switch plastics broken both situations can lead to direct contact with live electricity. It is advisable to replace deteriorating switches and power points for yours and your families safety. Changing old switches and power points is also a very quick and relatively inexpensive way to improve the look of your premises, especially if you have recently painted. Having an old cracked, yellow switch on the walls looks very bad compared to new, modern white switches and power points. Contact Florance Electrical Darwin today to arrange a free safety inspection of your premises. 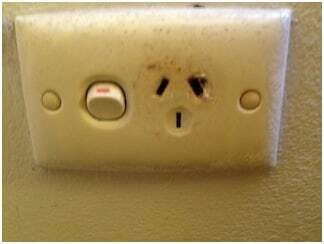 We will advice of any electrical problems we find, including broken switches and power points.